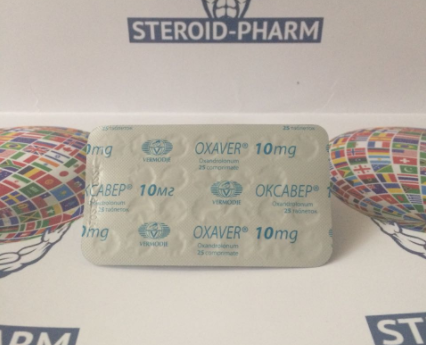 On the current page of our online store of steroids, we suggest you purchasing Oxaver, produced by Moldovan concern Vermodje. This drug is equally popular among the power lifters as well as among other athletes. The main ingredient, Oxandrolone, is a modified dihydrotestosterone molecule in which the second carbon atom is replaced by an oxygen atom. Oxandrolone was synthesized in 1964 and was originally used in the medical field as a component of medical treatment of anemia, osteoporosis, and also used to restore the body after injuries, bruises and burns. This drug is the most powerful anti-catabolic among its category. It is recommended because it suppresses functioning of the receptors which percept cortisol. Cortisol provokes gaining fat and reducing the muscle tissue. Taking Oxaver helps an athlete to reduce their body fat cells as well as maintain the gained weight. To preserve the accumulated mass of muscles, Oxaver is taken often between the courses of other anabolic. Various advantages Oxaver can also be attributed to raise the number of receptors that percept androgens into the body of an athlete. Taking Oxaver makes musculature appearance firmer and more resilient, relief as well as particularly pronounced venous pattern. Therefore, this drug is successfully used in steroid courses before demonstration performances and competitions for the bodybuilding as well as the other sports, where the muscle relief valued above all. Optimal dosage of Oxaver usually is selected individually for each athlete. According to the opinions of experienced people in this field, it is possible to achieve impressive results with taking 50-150 mg of the drug per day. Due to its "harmlessness" and softness, Oxaver can be taken by women, without fear of any negative consequences, provided that the recommended dosages of the drug (20-40 mg per day) are met and no longer than the duration of admission. Oxaver is not recommended for eating during meals, because this can lead to nausea and heaviness in the stomach. Experts argue that the daily dose of Oxaver should be administered in 3 divided doses over the same length of time. Oxaver can take a course of "solo" for 5-8 weeks, after which you can achieve a stunning relief of muscles. In combination with other steroids (testosterone esters, Primobolan, Sustanonon), a more pronounced anabolic effect can be obtained. During the "drying" period, Oxaver can be combined with taking Stanozolol or Clenbuterol. ·One of the main advantages of Oxaver is that it is not converted into estrogens, so there is no risk of specific complications in the form of gynecomastia or edema. ·However, sometimes with an incorrectly written course, nausea, headache, decreased appetite and decreased libido can occur. ·Oxaver is low in toxicity against the liver and practically does not reduce the synthesis of natural testosterone. 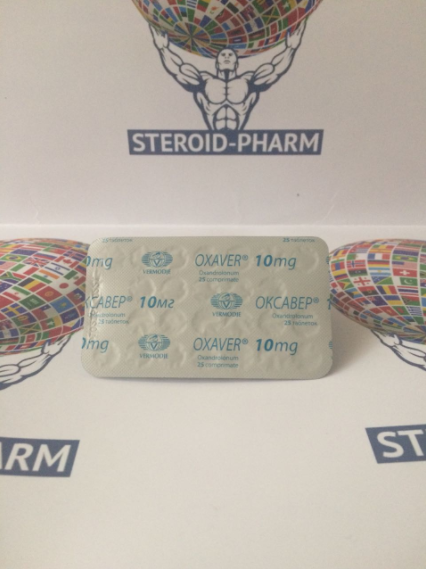 In our online store of steroids you can always buy Oxaver the price for which we have the lowest, both in Kiev and throughout Ukraine with prompt delivery to any region. In addition, we guarantee you the quality of the drug, because we cooperate directly with manufacturers of sports pharmacology and buy them directly from the plant. That is bought from us Oxaver is guaranteed to be "working" and fully justifies the expectations assigned to it.